Hi guys! In conjunction with World Book Day 2016, and to celebrate almost reaching 1000 followers in Instagram, we’re having a prize giveaway 😀 😀 Thanks so much for your support! Thank you very much to book donors & Books Beyond Brunei for your generosity! As an Instagram giveaway, the reposts and associated rules are applicable to Instagram. Reposts on other social media platforms won’t apply, sorry. Have fun with this and be creative! ✏️ Giveaway ends 21st April 2016 at 11.59pm (edited) 22nd April 2016 at 2pm and winners will be chosen based on how creative the slogan is. This entry was posted in Announcements, World Book Day and tagged Books Beyond Brunei, breadbn1kgiveaway, Heart for Art, Le Tour Boutique, prize giveaway, repost & win, world book day 2016 on April 16, 2016 by B:READ. Good day folks! 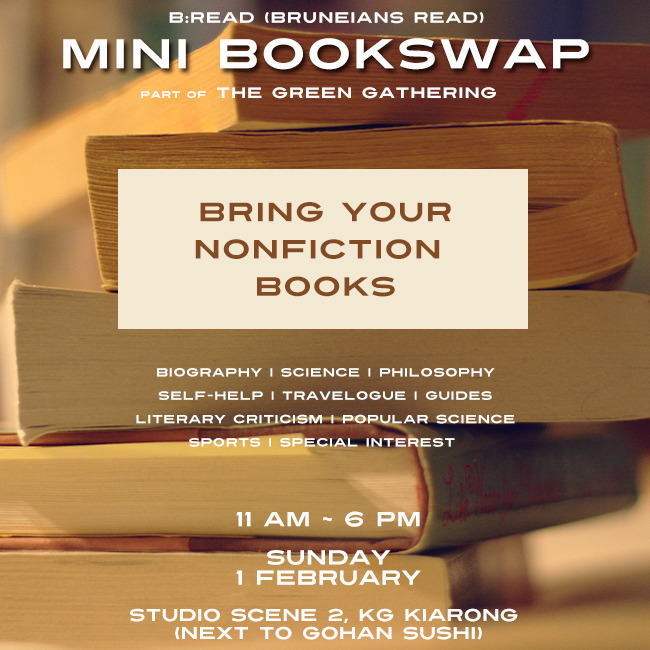 As part of the Green Gathering at Studio Scene 2 in Kiarong, B:Read will be holding a non-fiction themed bookswap on Sunday from 11AM to 6PM. This will be a great time to bring in biographies, self help, business and economy, art books and others that aren’t in the fiction category. We won’t be allowing textbooks to be swapped at this time. Please share, and we hope to see you there! Want more info on the Green Gathering? Check out the lovely organisers, Hip and Healthy and The Collective. This entry was posted in Bookswaps and tagged events with The Collective, mini swaps, non-fiction on January 28, 2015 by B:READ. The inaugural AMAZING READING RACE is a game where teams race to complete a course to stand a chance to win books and prizes worth up to $1,000 in total. Teams start from our booth and are led to the first station. At the station, teams are given instructions to collect the proof of completion from all six stations across the game area. Teams must visit each station in order, and participate in an activity within a short time period to collect their proofs. Once all proofs are collected they can collect their prize at our booth! Teams are timed from the first station to the last station. Time penalties are incurred for not completing activities in time period, skipping a station or not providing proof of completion at an activity. Top five teams who complete the course within a set time are invited to one final race on 21 December. Up to $1,000 worth of prizes up for grabs in the final race from Thebooktiquebn, Erosphilia, Enya Bijoux, FHZ Couture, Heartbead, Hs_colormadness, Tiqs Homemade Sushi, neonttwist, Nollybook, Rajka’s Kitchen and more to come! Games start at every half an hour. i.e 10.30am, 11am etc. Race starts from Bruneians Read (B:READ) booth located in first tent near the main entrance of Edutainment Wonderland. http://goo.gl/forms/VyrgNVzG8S or on the day. Early registration get a complimentary prize for participation. Each team is guaranteed a book after completing a drop-in race. All participating teams that complete the course will be given books! Dress in sports gear or whatever is comfortable. Race is held outdoors please keep hydrated to avoid dehydration. Bring an umbrella in case it rains. Teams must only contain two members. Teams will be briefed before the race. Race must be completed in sequence. Use of internet prohibited during the duration of the race or help from anyone outside the names registered under the team name. Time penalty incurred for teams not completing activity in time period, skipping a station or unable to show proof of completion. Teams are only allowed to participate in one race timeslot for the whole day. Top five teams with the fastest times from Drop-In Races on 14 December will proceed to Grand Finale on 21 December. If team should not be able to make it their place will be forfeited to the next fastest time. Rules are subject to change at any time without prior notification. This entry was posted in Amazing Reading Race, Announcements on December 8, 2014 by B:READ. Hi everyone! We’re super happy to announce that you may now visit our first ‘Free Library’, located at Gloria Jean’s Coffees at Citis Square (the block between Times Square Shopping Centre and Padang Kebajikan, Berakas). We’re kicking off with around 15 good books, which you can find on a small shelf inside the cafe. This batch includes books for children, teenagers and adults (we hope your kids aren’t drinking too much of that coffee). We’ve included several classics, various genres such as comedy and thriller, and also Brunei literature. How does the Free Library work? Feel ‘free’ to pick up a book! The fun doesn’t stop there, though! If you enjoy the book so much, you are encouraged to keep it and swap it with your own book from your own personal shelf. Yes, you may notice that this system is similar to our popular Bookswap events. No amount of money is spent through this system, just an exchange of books from one individual to another. With the swap system in place, more books of different genres are expected to make its way onto the shelf. The shelf will also be replenished at least once a month with new titles. What kind of books should you give back? We would like to remind you to please not ‘cheat’ and swap the books with textbooks, outdated books (e.g. Horoscopes 2010, Best British Universities 2002), or books in unreadable condition. Rule of thumb: If it’s not a book you would have ever picked up to read, it’s probably not a good fit; try a different book! We believe that reading should be made available for everyone, and we hope that alongside our Bookswap events, our Free Library can provide you with more options that cannot either be found in local libraries or bookshops, all at a free or swap cost. More Free Libraries under B:Read are expected to pop up soon. For now, pop over to Gloria Jean’s Coffee and you might find a book you have been dying to read on the shelf! This entry was posted in Announcements on May 9, 2013 by B:READ.